The Holy and Great Council held its concluding session on the 25th of June 2016, at the Orthodox Academy of Crete. 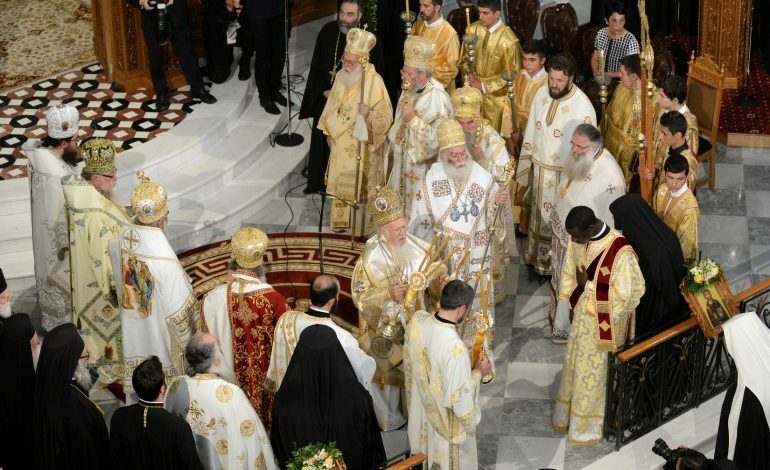 The work of the Council had commenced with the Patriarchal Concelebration on the Sunday of Pentecost, the 19th of June 2016, when the Divine Liturgy was presided over by His All-Holiness Ecumenical Patriarch, in Concelebration with the Primates of the Local Orthodox Autocephalous Churches, who were present, in the Cathedral of St. Minas in Heraklion, Crete. During the sessions of the Holy and Great Council, His All-Holiness Ecumenical Patriarch Bartholomew expressed his joy, for the willing and positive response of the Local Autocephalous Orthodox Churches in attendance. At the same time, he underlined the immense efforts, over many years, by all Autocephalous Churches in preparation of the topics on the Council’s agenda. The Primates of Local Orthodox Autocephalous Churches who participated in the Holy and Great Council, stressed the importance as well as the historical significance of the convocation of this Council. They also expressed their confidence that the Council opens a new era of conciliarity, for the Orthodox Church to express its positions on the contemporary problems of man in the world. 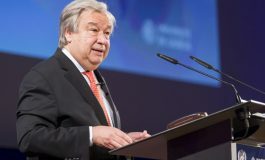 The sessions of the Council were not attended by the delegations of the Holy Orthodox Churches of Antioch, Russia, Bulgaria, and Georgia. The issues discussed in the Holy and Great Council, covered important topics such as, the Mission of the Orthodox Church in the modern world, the Orthodox Diaspora and the Operational Regulations of the Episcopal Assemblies, the Autonomy and the way for proclaiming it, the importance of Fasting and its compliance today, the Sacrament of Matrimony and its impediments, and the relations of the Orthodox Church with the rest of the Christian world. 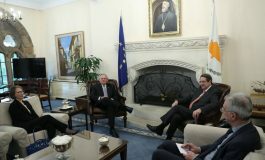 The Greek state headed by the President of the Hellenic Republic Mr. Prokopis Pavlopoulos, and the Greek government honored the Holy and Great Council in many ways and facilitated its work. The work of the Holy and Great Council was officially concluded on June 26th 2016, Sunday of All Saints, with the Patriarchal Concelebration. The Divine Liturgy was presided over by His All-Holiness Ecumenical Patriarch Bartholomew, in Concelebration with the Primates of the Local Autocephalous Orthodox Churches, at the Holy Church of Saints Peter and Paul, in Chania, Crete. Ηis All-Holiness Ecumenical Patriarch Bartholomew mentioned in his Homily that we should understand the Church as “substantially Synodical,” and the whole life of the Church as “life in Synod,” adding that the Synodical Decisions of the Holy and Great Council should be introduced in the life of the local Orthodox Churches. His All-Holiness added that conciliarity is another word that characterizes the unity, holiness, catholicity and apostolicity of the Church, referring to its Eucharistic and eschatological identity and consciousness. The Orthodox Church has declared its unity in the message of the Pan-Orthodox Council. The Orthodox Church stands for the protection of human rights from the power of state, as well as environment protection, the Pan-Orthodox Council participants said in a message Sunday. “Human rights today are at the center of politics as a response to the social and political crises and upheavals, and seek to protect the citizen from the arbitrary power of the state. The Church never ceases to emphasise that future generations also have a right to the the natural resources that the Creator has given us. For this reason, the Orthodox Church takes an active part in the various international ecological initiatives and has ordained the 1st September as a day of prayer for the protection of the natural environment,” the message read. In addition, the Orthodox Church declared it could become a regular institution to be convened every seven or ten years. The Orthodox Church intends to maintain inter-religious dialogue in order to promote relations with other churches, the Pan-Orthodox Council participants said in a message Sunday. 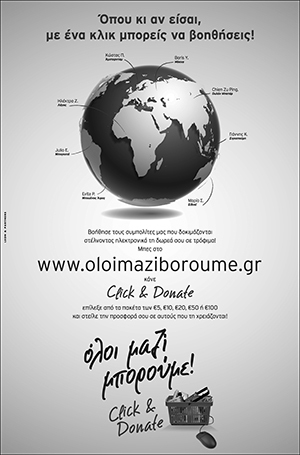 “… our Church attaches great importance to dialogue, primarily with non Orthodox Christians. Sober inter-religious dialogue helps significantly to promote mutual trust, peace and reconciliation. The oil of religious experience must be used to heal wounds and not to rekindle the fire of military conflicts,” the message reads. Orthodox Church has condemned hostilities in the Middle East, urged to stop expulsion of people and destruction of christian monuments, the Holy and Great Council of the Orthodox Church said in a message released on Sunday. “The Orthodox Church unequivocally condemns the extension of military violence, the expulsion and murder of members of religious minorities. She denounces the destruction of churches, religious symbols and cultural monuments… Our Council appeals to all parties involved to make systematic efforts without delay to bring to an end the military conflicts in the Middle East ” the message read. To God, “the Father of mercies and all comfort,” we address a hymn of thanksgiving and praise for having enabled us to gather during the week of Pentecost (18-26 June 2016) on Crete, where the Apostle Paul and his disciple Titus preached the Gospel in the early years of the life of the Church. We give thanks to the Triune God who was well pleased that in one accord we should bring to a conclusion the work of the Holy and Great Council that was convoked by His All Holiness Ecumenical Patriarch. Bartholomew by the common will of their Beatitudes the Primates of the local Orthodox Autocephalous Churches. Faithfully following the example of the Apostles and our god-bearing Fathers we have once again studied the Gospel of freedom “for which Christ has set us free” (Gal. 5: 1). The foundation of our theological discussions was the certainty that the Church does not live for herself. She transmits the witness of the Gospel of grace and truth and offers to the whole world the gifts of God: love, peace, justice, reconciliation, the power of the Cross and of the Resurrection and the expectation of eternal life. The Orthodox Church expresses her unity and catholicity “in Council”. Conciliarity pervades her organization, the way decisions are taken and determines her path. The Orthodox Autocephalous Churches do not constitute a federation of Churches, but the One Holy Catholic and Apostolic Church. Each local Church as she offers the holy Eucharist is the local presence and manifestation of the One Holy Catholic and Apostolic Church. In regard to the Orthodox Diaspora in various countries of the world, it was decided to continue with the institution of Episcopal Assemblies until such time as canonical rigor can be implemented. These assemblies are composed of the canonical bishops appointed by each Autocephalous Church and these bishops continue to remain subject to their respective Churches. The due function of these Episcopal Assemblies guarantees respect for the Orthodox principle of conciliarity. 2) Participating in the Holy Eucharist and praying for the whole world, we must continue the ‘liturgy after the Divine Liturgy’ and give the witness of faith to those near and those far off, in accordance with the Lord’s clear command before His ascension, “And you shall be my witnesses in Jerusalem and in all Judea and Samaria and to the end of the earth (Ac. 1: 8). The re-evangelization of God’s people in modern, secularized societies and the evangelization of those who have still not come to know Christ remain an unceasing obligation for the Church. 6) In contrast to the contemporary approach to marriage, the Orthodox Church regards the indissoluble loving relationship of man and woman as “a great mystery… of Christ and the Church”. Similarly, she calls the family which springs from this and which constitutes the only guarantee for the upbringing of children a “little church”. 7) In regard to the matter of the relations between Christian faith and the natural sciences, the Orthodox Church avoids placing scientific investigation under tutelage and does not adopt a position on every scientific question. She thanks God who gives to scientists the gift of uncovering unknown dimensions of divine creation. The modern development of the natural sciences and of technology is bringing radical changes to our life. It brings significant benefits, such as the facilitation of everyday life, the treatment of serious diseases, easier communications and space exploration, and so on. In spite of this, however, there are many negative consequences such as the manipulation of freedom, the gradual loss of precious traditions, the destruction of the natural environment and the questioning of moral values. Scientific knowledge, however swiftly it may be advancing, does not motivate man’s will, nor does it give answers to serious moral and existential issues and to the search for the meaning of life and of the world. These matters demand a spiritual approach, which the Orthodox Church attempts to provide through a bioethics which is founded on Christian ethics and Patristic teaching. Along with her respect for the freedom of scientific investigation, the Orthodox Church at the same time points out the dangers concealed in certain scientific achievements and emphasises man’s dignity and his divine destiny. 8) It is clear that the present-day ecological crisis is due to spiritual and moral causes. Its roots are connected with greed, avarice and egoism, which lead to the thoughtless use of natural resources, the filling of the atmosphere with damaging pollutants, and to climate change. The Christian response to the problem demands repentance for the abuses, an ascetic frame of mind as an antidote to overconsumption, and at the same time a cultivation of the consciousness that man is a “steward ” and not a possessor of creation. The Church never ceases to emphasise that future generations also have a right to the the natural resources that the Creator has given us. For this reason, the Orthodox Church takes an active part in the various international ecological initiatives and has ordained the 1st September as a day of prayer for the protection of the natural environment. 9) Against the levelling and impersonal standardization that is promoted in so many ways, Orthodoxy proposes respect for the particular characteristics of individuals peoples. It is also opposed the making of the economy into something autonomous from basic human needs and turning it into an end in itself. The progress of mankind is not connected only with an increase in living standards or with economic development at the expense of spiritual values. 10) The Orthodox Church does not involve herself in politics. Her voice remains distinct, but also prophetic, as a beneficial intervention for the sake of man. Human rights today are at the center of politics as a response to the social and political crises and upheavals, and seek to protect the citizen from the arbitrary power of the state. Our Church also adds to this the obligations and responsibilities of the citizens and the need for constant self-criticism on the part of both politicians and citizens for the improvement of society. And above all she emphasises that the Orthodox ideal in respect of man transcends the horizon of established human rights and that ” greatest of all is love”, as Christ revealed and as all the faithful who follow him have experienced. She insists also that a fundamental human right is the protection of religious freedom–namely, freedom of conscience, belief, and religion, including, alone and in community, in private and in public, the right to freedom of worship and practice, the right to manifest one’s religion, as well as the right of religious communities to religious education and to the full function and exercise of their religious duties, without any form of direct or indirect interference by the state. 12) The Holy and Great Council has opened our horizon towards the contemporary diverse and multifarious world. It has emphasised our responsibility in place and in time, ever with the perspective of eternity. The Orthodox Church, preserving intact her Sacramental and Soteriological character, is sensitive to the pain, the distress and the cry for justice and peace of the peoples of the world. She “proclaims day after day the good tidings of His salvation, announcing His glory among the nations and His wonders among all peoples” (Psalm 95). Let us pray that “the God of all grace, who has called us to his eternal glory in Christ, will, after we have suffered a little, Himself restore, establish, and strengthen and settle us. To him be glory and dominion for ever and ever. Amen” (1 Peter 5.10-11). 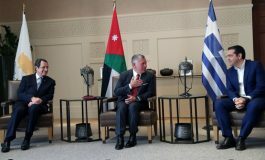 Next article 1ο Ετήσιο Ελληνικό Φεστιβάλ Τέχνης "Τιμαρέτη"